Both Dani and I are Toronto-based Instagrammers, and we were both craving an escape after a busy Summer filled with photo shoots, new projects, and tight deadlines. My birthday seemed like the perfect excuse to get out of town, and our attention quickly turned to Cuba. Neither Dani or I had ever been, and it seemed like the perfect colourful place to explore, eat, sip and shoot content. We arrived at the Memories Jibacoa Beach Resort an hour outside Havana with no idea what to expect. We were met with sticky hot sunshine, sprawling white sand beaches feeding into the bright turquoise sea, Piña coladas at every turn and the best hospitality we’d ever encountered. 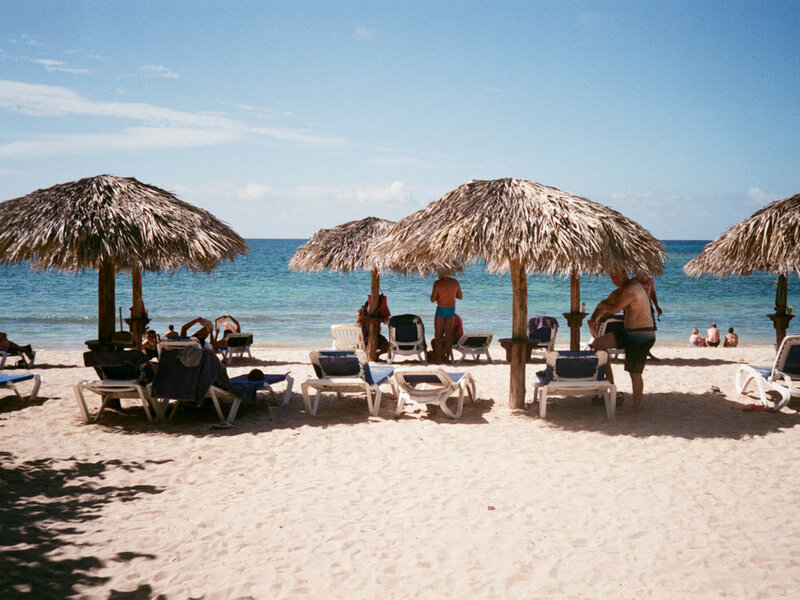 Every minute in Cuba was bursting with energy, excitement, and friendly faces, whether we were on a catamaran to the reef at the resort or wandering the streets of Old Havana. This tropical country was loaded with endless candy coloured photo opportunities laden with lush greenery and unexpected historical details. In short, it was an Instagrammer’s dream! Dani and I both have our own specific creative perspectives and see the world through a unique lens, and though we were in the same place at the same time we saw things a bit differently. Scroll down to see Dani’s photo diary from the trip, and read each of our takes on the trip! Alyssa of Random Acts of Pastel: There’s something oh so lovely about mixing up your routine and escaping to somewhere completely new. The colours, friendliness, and energy in Cuba was a welcome change from days in Toronto spent tracking down even the tiniest corner of pastel! Some of my favourite elements of the trip included the super friendly dogs and cats “on vacation” at the resort, snorkeling around the coral reef surrounded by fish, donuts for breakfast, the crazy amazing hotel staff, splurging on dinner at one of Havana’s best Paladares (aka. hidden family-run restaurants) and searching the city for pink taxis. Memories Jibacoa was an only an hour from Havana, so we got the perfect mix of fast-paced urban exploration and laid-back resort life. Dani of @daniesque: When work is busy, tackling 100+ hour weeks seems like a no-brainer. However, as I’ve witnessed first-hand, the burnout is real – and maintaining the reputation of being someone “bad at going on vacations” is not sustainable. As I’ve gotten older, I’ve begun to crave new experiences outside my insular reality – which, for the past few years, has consisted of dividing my time between Toronto and New York. Unfortunately, the hustle and bustle gets exhausting quickly, and I recognized it was time for some time away. From bright blue water to colourful buildings in Havana to Piña coladas for breakfast to warm sand between your toes as you run to listen to a live band playing Despacito, my trip to Cuba with Alyssa is one I will never forget. For a few days, I got to see what an alternative reality could look like – one that purposely removed me from my work when I thought I needed to be there most. Memories Jibacoa – with friendly staff, sprawling beaches, and a plethora of photo opportunities – proved to be the most hospitable home-away-from-home I could have ever hoped for, and I know I will be back to visit soon. Until then, I will carry memories of singing “Summer of ‘69” at the Piano Bar with me for the rest of my life.